Rey España has over 38 years of experience in community development including affordable housing, neighborhood initiatives, small business development, acquisitions and turnarounds, workforce employment and training, community development financial institution planning, financial education and individual development accounts program, direct emergency housing and energy assistance service development, home repair and weatherization of low income housing, and education. For the last 10 years, España has been Director of Community Development at NAYA, a nonprofit that has grown over the past decade from a relatively small nonprofit to an organization with a nearly $10 million budget and over 100 employees that serves over 6,000 families. Could you talk about your background? How did you become involved in community economic development and community wealth building? Well, first of all, I’m just another guy out of East Los Angeles; I spent my early years on a farm and moved with my family into East Los Angeles in 1952. My community development experience probably begins in 1975 in Long Beach, where I directed a nonprofit that primarily focused on social services and workforce development and child development services. Under my direction we moved from youth employment and training to housing rehabilitation. That was my introduction to comprehensive community development – employment and job training. The agency was Latino focused, so we had English as Second Language training, social support for children and their families. That was in the late seventies. Then I went into the private sector. I had a gym acquaintance that eventually became my employer. He was a typical entrepreneurial businessman. I did a variety of special projects for him for about a five-year stretch. He was somewhat of a venture capitalist. He had a number of holdings in steel and ornamental iron manufacturing and I did business acquisition, management, and turnover companies. I set up an import company for him and purchased a gazebo and custom hot tub and deck manufacturing company. It was during this period that I had my first taste of profit-and-loss responsibility and gained valuable insights into private sector and for-profit business practices. After my private sector experience, I went to work for the City of Santa Monica from 1984 to 1990 in their Community Economic Development department. I served there as the CDBG (Community Development Block Grant) coordinator. I had responsibility for all federal and local dollars for community and neighborhood services and projects, including public service contracts ranging from homeless services, community-based organization supports, and senior services. There was a separate housing unit within the department. I was the overall coordinator of sorts and responsible for federal and local compliance. I did that for almost seven years. Additionally, during that time, I also performed project management on several capital construction public works projects, including a senior service center, a homeless center and shelter for women, and a multi-tenant building that included a community organization support center, two for-profit commercial art galleries and a food bank operation. In 1990, I left Southern California and took a job in Multnomah County (Portland, Oregon). I was hired into the Aging Services department. I was hired to be the manager of the County’s anti-poverty resources—everything from homeless and emergency housing services, low-income energy assistance to community action programs and community development block grant (CDBG) dollars. I was the coordinator of these federal community development dollars and responsible for the implementation of projects. I represented the county and worked with the city of Portland to restructure the homeless singles system of shelter and services. In 1996, I shifted to special assignments in the County Human Services department and became more involved in planning for aging and disability services and mental health services. I prepared all the Older Americans Act requirement plans and state mandated plans and contracts. I had an extensive tour of duty from federal projects administrator to the role of coordinating planning for social service delivery in the County. I resigned my position and left the County in 2003. I had spent nearly 13 years with the County. I felt I wanted to do something a little bit more hands-on. At first, I worked as an independent contractor for the Latino network, a newly formed community based organization. It was prior to leaving the County that I became aware of what was then the Native American Youth Association or NAYA. I worked with former director Geoff Roth and then Nichole Maher. That’s when I became aware of NAYA, the organization. After a year of doing independent contracting with the Latino organization, NAYA had an education position available, so I called Nichole and expressed my interest and she encouraged me to apply. I was hired in 2003 and have been with NAYA ever since. I’m now ten-and-a-half years in. With my background and experience in general community development—both from a community nonprofit perspective and a city and county perspective—I brought those skills, knowledge and interest to the organization. At the time of my hire into NAYA, it was primarily a cultural and academic support organization for Native children. They had a very active volunteer recreation and sports program and a pretty active academic support initiative. They had also been involved in some domestic violence intervention work. When I came to the organization, it had less than a $1 million budget. Now we’re an organization with 120 (FTE) staff and our budget exceeds $9 million. The needs of the organization when I was first hired indicated interest in certain areas of workforce and housing. I brought in grants and contracts to deliver employment and training services to youth and adults, emergency housing, rent assistance and homeless prevention activities. Moreover, I brought a community economic development and community building perspective of doing community work. Through our education work, we developed a private education facility, the NAYA College Academy, which we operate as an accredited high school with a current enrollment of 86 students. I developed NAYA’s capacity in affordable housing. They have acquired a housing portfolio – we became a low-income housing provider and now own 53 units and a new 40-unit project, NAYA Generations, is in the planning cycle. We have established a microenterprise and small business support program. We have established a financial services program and will launch a Native CDFI (community development financial institution) project in 2014. And we have launched two social enterprises. We have grown very rapidly. What are NAYA’s main program areas? NAYA has three primary service departments; we have our youth and education services department, our family services department, and my department, which is community development. Youth services goes from kindergarten to high school; it involves academic support, such as tutoring, cultural programming, recreation and sports services. Education services also include our high school, the NAYA Early College Academy. Family services are everything from domestic violence and foster care support, to early childhood services and senior services–that all is family services. And the third department is community development. My vision for the department is capacity to serve Portland’s urban Native community with an integrated comprehensive poverty reduction continuum of support. It includes everything from emergency housing to energy assistance to financial wellness and financial education skill building, including personal finance. It includes household budgeting and credit repair as well. We also are a financial fiduciary organization and have individual development accounts for post-secondary education, microenterprise development, and homeownership. We have career skills, job search training, job readiness activities and services for both youth and adults. Our Homeownership program helps individuals prepare to buy home and become first-time homeowners. We undertake a range of support activities from homeless prevention to stable tenancy to support to buy a home. We also have very active microenterprise and small business support program services and social enterprise programs. We also are very active in sustainable economic development planning and neighborhood focused economic development community initiative and innovative housing development. What are NAYA’s main values and principles in its work? At NAYA we have a clear mission to work in partnership with the community and promote cultural identity and education. The organization prides itself in incorporating traditional Native values of respect, community, generosity, and kindness. We pride ourselves at NAYA at having that understanding and creating an organization that allows us to work with people wherever they are at. We have a model of service delivery based on an indigenous worldview for all services delivered by agency staff. The Portland Native community has many challenges reflected in traditional socioeconomic indicators, including having a high poverty rate, poor educational success, high unemployment, high rate of homelessness, poor health indices, high-risk behaviors, substance abuse, and violence. But the culture is strong. Our approach says that communities can overcome their challenges once they become stable. It’s about healing themselves, making good choices, having the ability to plan and do the necessary work to take advantage of available resources and build the skills, knowledge and abilities to improve their life situations. My experience—I am guided by a vision for social justice, equity, and creating economic opportunity for communities of color. We try to validate that vision daily. It is about planning actions that have a basic understanding and foundation that honors and respects the community’s collective and personal assets, talents and strengths, and provides services in a culturally appropriate manner. We work with staff to have a common vision and approach to service. Ultimately, for NAYA community development, it’s about promoting housing, economic, and financial security. Visions, values, and action—that is the approach that has guided my work. This is true specifically with my experience serving the Latino community and for last almost eleven years with the Native community in Portland. What led you to work with the Native community in Portland? What would you say are some common challenges among Latinos and Native Americans and what are some unique challenges that Native communities face? I grew up in East Los Angeles, California in a Latino or Mexican household. My indigenous side comes from my dad’s side. He comes from Yaqui people in northern Mexico. So I have that connection to my indigenous family roots through him. I say that because it is part of my personal family experience and development and support. I grew up with a strong Mexican culture. My folks were bilingual (English-Spanish) and some of our cultural practices were a mixture of Latino and Indigenous/Native cultures. How I relate to this is that I identify as a Chicano, which is a Mexican-American and indigenous worldview. That was my initial orientation that motivated my early social justice work—for the Latino community, but also for other communities of color, I have a rich multi-racial, multi-cultural connectedness from my living and working in Los Angeles, Long Beach, and Orange County. This also includes my working relationship with Southeast Asian refugee “boat people.” In short, I’ve enjoyed the blessing of working and serving a lot of different tribal organizations and communities. I have a sense and perspective that we are all connected. I have a Mexican American side and an Indigenous side. That’s how I approach my community work. While I work with the Native community in Portland, I see and understand the challenges faced by many communities—Native and non-Native. That’s my general approach. There are similar socio-economic challenges. They include educational success or lack thereof, as well as the high poverty rates and high unemployment, criminal justice involvement of youth and adults and poor health care access. Additionally, the lack of an organized political voice is characteristic of a lot of communities of color. My background propels me to give voice to those who struggle. Additionally, other challenges include poor health indicators, economic indicators, housing instability. We focus on those kinds of challenges, which are shared by many communities. A unique pressure for the Native community is that Native Americans continue to really struggle with is how to maintain their traditional languages and beliefs. There have been lingering effects of federal policy that had been aimed at literally abolishing Native American people, their traditions and cultures. This life experience is all relatively recent history and fosters the broadly held fear and mistrust of government. In Indian Country, there are two distinct experiences, the Native American reservation experience – and the fact that large numbers of Native people have moved off reservation to urban centers. Portland is one urban center with significant Native population—the ninth largest in the country. You have two real different experiences, the urban Indian experience and the reservation experience. Those are some of the challenges. For Latinos, while there is always pressure for assimilation, it has been relatively easier to retain the Spanish language. Many Spanish speakers have migrated north to the United States from Mexico and other Central and South American countries. The United States is a destination for many Spanish speakers primarily for economic reasons and pursuit of the “American dream”. Language retention is stronger. There is a lot more of a challenge to preserve language in indigenous communities. What has been some of the key moments in the historical development of NAYA? The NAYA story – it was started in 1974 by concerned parents and community members to maintain cultural identity. The focus was on cultural preservation and positive recreation and sports activities. The idea was to try to be positive for the children. That was a significant community organizing effort. For the next 20 years, NAYA remained an all-volunteer organization. The community members who were actively involved saw trends where young people were facing challenges. In 1994, NAYA incorporated as 501(c)(3) nonprofit to begin to plan a more comprehensive intervention with a focus on young children and youth. NAYA recognizes violence as a key challenge in the Native community, especially domestic violence and creating support services in that area was a very strategic direction for the agency to undertake. NAYA began to offer domestic violence safety and support services in the late nineties. A few years later, staff realized that it was not just young people that needed attention—we needed to work with their families. Around 2001, a name change was filed, changing our agency name to Native American Youth and Family Center – in recognition of the work with families, beyond working with young people. Moving beyond providing academic and tutoring support to Native children toward undertaking a more prominent role in participating in the business of education is another significant moment in agency development. NAYA’s work in this area moved quickly when I secured a planning grant (2005) to look at the feasibility of starting a small high school. The NAYA Early College Academy opened in the fall of 2007. So if you think in stages it started first as a volunteer organization, then incorporated, then added youth programs, then domestic violence support services, then education. After that, we added workforce and housing. In 2009, we started to develop an affordable housing portfolio. In 2010, we moved in the direction of financial services starting with financial education and individual development accounts and we’re currently pursuing development of a Native CDFI for loan making for NAYA’s micro enterprise program and other community focused economic development projects. Our current planning priority is sustainable economic development. Could you talk about the development of the NAYA Early College Academy? How did that project come about? When I joined NAYA, there was interest in becoming more active in education, we were active advocates concerned with the dismal performance of Native children in Portland public schools but we were not really involved, we were just concerned. Our first action was a partnership in 2004 with Portland Opportunity Industrialization Center, a local alternative school. We partnered with them and implemented a classroom that was just for Native students. We did that and had some good results. Our partnership continued for nearly two years and gave us a start in that area. At that time, I became aware of an initiative around high school reform. I went to a presentation and found out there was a Native-focused program in Washington, funded by the Gates Foundation, but it was only focused on and within the Washington state. There was some talk about expanding, which they did. I monitored that situation. When it came time to pursue that, I reached out to their administrator at Antioch University, Seattle, who was their program officer. I secured a planning grant. That led to an early college contract, which became the Early College Academy. We had 18 months to plan. It was during this period that the Northwest Area Foundation made a significant grant award to NAYA to facilitate securing and developing an educational facility. We had to secure a facility, which I did in northeast Portland. In the fall of 2007, we welcomed the first class of 32 young people and we’ve grown to a current enrollment of 90 or so. I was involved in the initial planning grant, site identification, and hired the first principal. We chose the route of setting up a private high school. We wanted to have as much influence over curriculum and resource control as possible. We have been very happy with that approach. We not only have grown enrollment, but we have graduated up to 94 percent of our students and have great attendance and our outcomes are closing the educational disparity gap in educational success for Native youth. We have received really good recognition in that our approach has been a judged to be a promising practice and it continues to do well. Could you talk about the Kah San Chaka Haws (east house) project? The Kah San Chaka Haws project is a nine-unit multi-family, rental-housing complex. What is interesting about this project is the construction technology. It is modular construction and has very positive environmental outcomes. It is rated LEED (Leading and Environmental Excellence in Design) Gold. We wanted to demonstrate that that technology could produce a quality housing unit faster and more energy efficient performance than traditional stick-built housing. My background in affordable housing comes form my earlier days in Santa Monica. An architect friend of mine, Stuart Emmons, who I worked with in Santa Monica, helped come up with a project that would test these new ideas. The Kah San Chaka Haws project is the first of its kind in the Northwest—three stories, nine units, modular construction. It was a project that went from site preparation to occupancy in seven months. That is 40-to-50 percent of the time necessary for development of traditional housing. We reduced the time it takes to build an affordable unit by more than half. Our cost per unit was approximately five percent less. We think with this type of design—­the cost per unit will be within the $130-150,000—has considerable promise. The cost is about $100,000 less than recent traditional construction projects in the Portland area. We still have a way to go. The idea is to challenge the local housing industry to produce housing faster and cheaper but with high quality. There is substantial national interest. HUD (US Department of Housing & Urban Development) published an article about the project. The HUD Native American Program office in Seattle recently toured the project and also seems very interested. So there seems to be interest. I did it through a development team working with local professionals and bringing in the technical people as required. It was truly a public-private partnership. Our second project, now in planning, is the NAYA Generations project. That project will be the re-purposing of a former public elementary school (approximately 3 acres) – convert the grounds to 40 units of housing, a Long House cultural and community service center and an early learning center. The 40 units will be inter-generational housing with 10 units for families and 30 units for elders. We’re focused on providing housing for Native foster children—we want to celebrate the children exiting the foster system and moving into permanent families. A social service building, the Long House, will provide health, counseling and employment services and an early learning center which would have 160-180 children from birth to age six. NAYA and its partners will create parent interaction programs – Head Start and other child development programs and services. The early learning center is about preparing children for readiness for public education. When do you anticipate this project coming on line? We just launched our public community planning process. NAYA has site control. I would estimate it is probably two or two-and-a-half years away from completion. Hopefully, by 2016, we will have both the housing and educational learning facility in place. What are the market barriers that are keeping these mechanisms from being used more commonly? It is the use of a different technology. We decided to take a different approach. It was a learning process. We had a situation where we had a groundbreaking in June, site prep work in August and September, and the actual installation of the modular housing units occurred over three days in October. From the standpoint of neighborhood impact and noise, there were only three days where we had to divert traffic. The next three months we spent finalizing the work. By January, seven months after we began, the development was completed and final inspections followed. We went from a vacant lot to nine units of housing. No one has done that in Portland. I can’t tell you why. There is a well-established affordable housing industry committed to traditional methods and approaches. We tried to challenge local folks to look hard at this approach. There will be local procurement opportunities for housing in early 2014. We wanted to prove the approach was an effective and efficient methodology. It is still too early to tell if Kah San Chaka Haws will have any impact on the industry as a whole, but we’re optimistic. There just needs to be courageous leadership in place and the funding available to support the initial investment in innovative housing approaches to expand the opportunity for more projects. What led NAYA to adopt sustainability as an area of focus? How does NAYA pursue this? Sustainability and environmental stewardship have become more central to our work in recent years. I described earlier the development of the NAYA Early College Academy. My early writings on the school envisioned a school that had a direct tie to the land, an ecologically connected school. We need to honor and take care and live in harmony and balance with our environment and surroundings. Active stewardship can play an important role to both teach and learn from. We want to demonstrate on our site interest in sustainability practice. At the site, we installed a solar panel roof, which has led to a 15-percent reduction in our energy costs. We wanted to and continue to demonstrate sustainable consciousness. We changed the heating system and updated the electrical system to incorporate more green and sustainable practices. This includes solid waste disposal too. Our current planning includes looking at our property. We are interested in food production on site, so there are urban farm options we will consider and a number of related sustainability initiative activities that we are trying to implement. I went to the NAYA Board, a year and a half ago, and described the type of sustainable development interests that I was looking for opportunities to explore. The Board endorsed and encouraged our interest in sustainability and building practices is simply about doing the right thing and being a good steward. Nationally, who does NAYA see as its counterparts? Are there other urban Native American organizations that have had similar growth? I’m not as familiar with many of the other urban Native community center programs throughout Indian Country. I do know that Little Earth of United Tribes in Minnesota is very similar in some regards to NAYA. We are trying to explore some of the similarities between NAYA and Little Earth in our housing area. There are groups in Seattle and Denver that may be similar to NAYA. There are certainly similarities but at a different scale. The feedback I get from visitors that visit NAYA is they see NAYA as quite unique. It’s common to hear from visitors that they would like to have something like this back home. That can be anywhere in the nation. Something that NAYA has built up over time is our ability and capacity to engage in comprehensive community development. Could you describe the Cully neighborhood and the “Living Cully” movement? What is NAYA’s role in this coalition? NAYA property is in the Cully neighborhood in Northeast Portland. That neighborhood is a very diverse neighborhood in terms of ethnic and racial makeup. It is mostly low income. It is an area of disinvestment, so there is not a lot of economic development or growth that has occurred over time. It has been a neighborhood in transition for a number of years. Other neighborhoods have had more investment that has created pressures that has prompted gentrification and involuntary displacement of large number of communities of color and indigenous community members. There is well-documented evidence and experience in Portland where urban renewal investment has destabilized established neighborhoods. Cully has not experienced that yet, but is now drawing attention as one of the last remaining affordable neighborhoods to live, which could lead to pressures for involuntary displacement. So here in Portland, there has been an effort to maintain and improve neighborhood environmental performance. The local planning initiatives have been eco-districts. They have been linked to urban renewal areas, of which Cully is not, but is adjacent to them. For the last few years, a few community organizations—including Verde, Hacienda CDC, Habitat for Humanity, and NAYA—have been actively involved in building a collaboration within Cully and to redefine and use environmental and other capital investments as an anti-poverty strategy. The vision is that Cully residents and communities of color should benefit directly from those investments through job training, employment opportunities, enhancement and development of green space. And we want to do it from a community driven engaged process in Cully: we call it the “Living Cully” Eco-District. We are not sanctioned by the city as an eco-district, but we decided to call ourselves that anyway. We use green investment as an anti-poverty strategy – where strong community development can take place. We will promote home repair and weatherization improvements to existing homes and small businesses as an anti-displacement activity. We will promote housing development and create home ownership opportunities with Habitat and do a lot of green space planning to make sure our communities can actively utilize green space. That’s the Living Cully eco-district. Some of the work we have done on community engagement has received some attention from foundations. We are working with and supported by Surdna, Northwest Area Foundation and PolicyLink. There is a lot of interest in our community-driven approach to revitalization. Could you describe the social enterprises that NAYA runs? What have been your successes? What are the key challenges? The first social enterprise effort was with catering. It was an activity initially related to our school. We took an existing unlicensed kitchen facility and developed it into a commercial standard operating kitchen that was not just for institutional meals, but would provide us the capacity to establish a catering enterprise and cater special events and meetings, not just with a Native cuisine. We launched the catering enterprise about three years ago. It developed very slowly over time. What we have learned is we have the capacity to produce, but we learned the importance of marketing and getting our word out and making sales! The challenge is learning how to manage effectively and efficiently labor costs and food purchases. We think there are better ways to be more efficient and get a better margin of return. We’re capable but we need to learn how to be more profitable. We’ve learned by practical experience. We have much to learn from others in the industry. The other enterprise we call NAYA Construction. This is a response to our community’s interest in construction work, but they could not be qualified for participation in standard construction apprenticeship programs. What we decided to do is to develop an introduction to the construction trade activity though a workforce training program aimed at on-the-job work experience and knowledge building. We launched NAYA Construction on a very small scale, with a single trainer and crew of four. We have a person on staff that was a general contractor – his license has been transferred to NAYA and he is our principal trainer. NAYA Construction offers a 6-month training program. We seemed to have found a niche in our sales–folks that buy our service are interested in supporting the training program. It may take a little longer, but we’re competitive on price and deliver quality service. We have experienced marginal success. It pays for itself. NAYA construction does routine maintenance and repairs and turnovers for the 44 units of multi-family housing that we own and does similar services (including landscaping, etc.) for other community development corporations. We have four graduates who have been placed with other contractors. We plan to hire a second trainer and have a crew of eight in 2014. How does NAYA go about working with local public officials? Here is where my prior history working with the County directly has impacted NAYA. I became involved in local county government in 1990 and had to establish relationships. At the County, I was a liaison to the City of Portland bureau of housing and community development. I was directly involved with the County government elected commissioners and city commissioners as well. Through my personal history, I have brought that approach to building relationships to NAYA and have been able to introduce NAYA to the City, County and Metro regional governments. It has been and is very important to build solid relationships with government staff to advance ideas and get investments in capital processes and to expand services to vulnerable populations. Our education work has also forced us to develop a relationship with the school board—establishing contracts with Portland Public Schools requires us to build relationships with administrators and the elected school boards. Over the past decade, NAYA has had tremendous growth. How has it managed that growth? We have seen really rapid growth and endured growing pains. Even in the last 5-6 years we have tripled the amount of staff. While we have been very successful in capturing service contracts and affordable housing resources and started the NAYA Academy, we knew we needed to develop the necessary administrative infrastructure to manage and support our rapid growth. We’ve been fortunate to have Lynn Ward as CFO (chief financial officer) who was the budget director of Portland Public Schools for 24 years – she heads the financial and business operation section at NAYA. Having experienced managers with the scope to manage large staff and budgets has helped us develop the infrastructure. Human Resources and personnel management practices – we’ve had to develop them on the run. We’ve gone from 25 to 120 staff over the last seven years. That’s really rapid growth – the procedures, practices, business operations and management have been pushed to a larger and more complex scale. The complexity of community development work in terms of risk management and liability exposure has required extensive legal staff work. Our success comes with growing pains. We’ve experienced that. We are managing pretty well. NAYA, the organization, is blessed. Our budgets continue to grow. Our good work is acknowledged and supported, so we can continue to meet daily challenges of our community. That’s the testament to the hard work our organization has done. Of course, we’re always trying to advance investment. We will continue to do that. But yes, rapid growth requires staff training, staff development, bringing other expertise in, updating and improving technology, and system development. We’ve done it all. We have had to. Could you discuss the challenges of succession? Not only did NAYA change executive directors 18 months ago. You may retire soon. How does NAYA manage this challenge of ensuring institutional continuity even as key personnel change? That’s been a topic of discussion for at least two years. Succession planning centers on trying to bring skill sets into the organization that is value added and complimentary. We feel strongly that we must support the continuity to manage the NAYA way. That’s been on our plate the last couple of years. Matt Morton, our new executive director, is transitioning in very well. He brings a different style and approach. Matt is the first Native community member to be elected to Portland Public School Board. 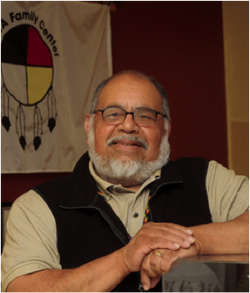 In terms of leadership and vision, he is identified a passionate leader for Portland’s Native community, a strong voice on social equity and especially in education for all children. He is a strategic alliance builder with other communities of color leaders. Our CFO, she is not planning to retire, but we have hired a deputy director to build continuity within her department. For myself, I hope to identify an assistant and working with them and identifying my successor over the next few years. My case is different in that I have served the agency as its “seer.” I’ve been recognized by the board and staff as the visionary. It is an honor and privilege to serve and I feel a deep responsibility to secure an effective successor; this pressure is ever present. We are also looking to manage the process as best we can and provide the continuity and support of organizational over time—we are not rushing. We are looking for candidates who have the vision and will be here for the long haul as well. Are there specific areas where Native American organizations need to focus their efforts to improve capacity and accomplish their goals? NAYA as a model continues to define and build its capacity. Part of the practice is working with the broader community. This includes marketing and telling the NAYA story, educating funders about the challenges and opportunities for positive change. Also, there is a need for strategic alliances with other communities, which allows us to draw attention to the many individuals, not just Native, who suffer from economic disparities. We can work together so all get there together. We can provide leadership and build alliances and community building to advance a broader agenda. NAYA can be instrumental in providing a different voice, a strong voice; it may be also a missing voice. Training and capacity for advocacy, social media and marketing, these are skill sets. All of these are areas that an effective organization needs to be aware of and engaged in. And it is not only about the tremendous needs, we need to reframe investment in terms of outcomes that have a broader appeal to investors to bring about the change we want to see. We need investments that not only address the challenges of the most vulnerable of our community but that seize the opportunities to achieve long-term positive outcomes. We want to share our experience. We’ve made our share of – I won’t call them mistakes – but we’ve learned a lot along the way. We are happy to share that. What role can public policy have to better support Native Americans? The policy priority at NAYA has not been just one key one. That said, one policy area that has resonated for us is education and educational disparity. For Native children, education reform is critical for our children. Here in Portland, much of the current work is to get children ready to learn. Yet in public school, they become disengaged in disturbing numbers. Native children are not making it through the publicly funded education system and graduating from high school ready for postsecondary education or a career. This fact is not only true for Native children but for other communities of color as well. Another policy area of concern and focus is child welfare. Native children are overrepresented in the foster care system in high disparity compared to white children. That is another policy area that is both frustrating and challenging. This has a longstanding matter of concern and advocacy. We have tried to address that through recent state contracts. We are just starting to get more relief and cooperation. Through the NAYA Generations project, we hope to spawn a new era of better relationship with State Human Services. Those are the two biggest areas we are involved on. Another policy area of interest and concern is housing. I sit on the Portland Housing Commission and have raised the concern of equitable access to housing opportunities. Additionally, cultural specificity – housing, homelessness have not been defined from a culturally specific perspective. It can be eye opening for officials. The final policy area I would include is economic development. The level of unemployment in the Native community is significant and Native Americans are under-represented in the small business ownership community. There are significant challenges and opportunities to promote economic security for Native people. If you had to highlight a few key accomplishments of NAYA’s work to date that you are most proud of, what would they be? I am very proud to have brought community economic development vision to NAYA and have been successful in implementing my vision. Of course, starting the NAYA Early College High School is a tremendous personal highlight. To see the school established was a personal goal. It touched me personally. Community members have said to me that they never thought it would happen for the community. Recognizing how important the school has been—that has touched me and has been a profound impact. From the response I get from our elders, our young people, and parents, it is clear that the school has been the biggest thing for the NAYA community in its 40 years in Portland. Coupled with the planning and development of the NAYA Academy was the financial investment of the Northwest Area Foundation in the mission and work of NAYA. A significant grant was made to NAYA to develop the school facility and provide general operating support to launch community economic development programs and services. We leveraged that grant to move NAYA (2006) from a small inadequate facility to our current location where we co-located all staff and programs. Three years later in 2009 we purchased our entire 10-acre campus from Portland Public Schools, ensuring a permanent home for NAYA. Many skeptics thought it would never happen, but in the NAYA way, we continue to demonstrate our ability to deliver on Native community goals and priorities. I am very proud to have brought affordable housing to NAYA. Having ownership of a small housing portfolio is significant. I am personally very proud of the Kah San Chaka Haws (East House) project – and in our ability to form a public-private partnership and get that an innovative housing project implemented. I think our work in developing capacity around micro-enterprise is being rewarded by expanding our contracts and getting more capacity. We are expanding our role in individual development accounts (IDAs), and bringing a Native CDFI forward will be very significant as well. I’m very proud of that. Certainly the work we’ve done on the NAYA Generations project – that I just launched – is a significant accomplishment for NAYA. The final area that I feel very comfortable with is promoting social equity at the city, county, and regional level. This includes job creation, business development and improving economic opportunities to address economic disparities for Native community and other communities of color community members. I see that very much in the social justice vision. I am very proud of that work. I’m very optimistic and hopeful for 2014 to be a year where we move further on economic development and sustainable development for NAYA. I see it as a critical year. I think it will be a good year for NAYA.